St. Catherines Island is home to many species of reptiles including snakes, lizards, and turtles, tortoises, and sea turtles, two species of these form the bases for ongoing, significant, active research programs in herpetology. 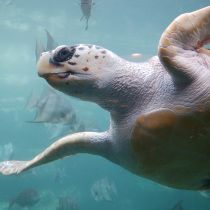 The loggerhead sea turtle (Caretta caretta) is the most common sea turtle nesting on South Atlantic beaches. The species inhabits the tropical and temperate zones of the Atlantic, Pacific, and Indian Oceans. 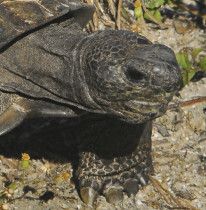 Two populations of gopher tortoise (Gopherus polyphemus) were translocated to North Pasture, in the northern section of the Island. The first arrived between 1987 and 1993, with 25–30 unmarked individuals released.